Posted on Sun, Feb 19, 2012 : 4:06 p.m.
Jazz trumpeter Wynton Marsalis will perform some of his favorite music Wednesday at Hill Auditorium. Bar Louie will have a "Fat Tuesday Bead Bash" where you can win $1,500 toward your tuition. 5 p.m. to 2 a.m. on Tuesday. There will also be a DJ, beads, cake, drinks, $1 burgers and more. Be sure to bring your student i.d. Free admission. Bar Louie is at 401 E. Liberty St., Ann Arbor. 734-794-3000. Come to Gratzi for "Big Top Revue 3," an Ann Arbor Summer Festival Fundraiser, on Tuesday. 6 to 10 p.m. Cocktail reception at 6 p.m. with hors d’oeuvres. Enjoy a three-course dinner with speakeasy-themed live entertainment. That will be followed by coffee and late-night follies.1920s-attire encouraged, especially flappers, fedoras, pinstripes and pearls. $150. Purchase in advance at annarborsummerfestival.org or by phone at 734-994-5999. Gratzi is at 326 S. Main St. Ann Arbor. 888-456-3463. "The Moth: Live Storytelling" is back at Circus Bar & Billiards on Tuesday. The third Tuesday of every month. Doors open at 6 p.m., stories begin at 7:30 p.m. This week's theme is "Bosses," which should provide some fertile ground. Since each story is true and every voice authentic, the shows are a unique, intimate and often enlightening experience for the audience. $5 at the door. Circus is at 210 S. First St., Ann Arbor. 734-332-9900. Don't tell the kids they'll be learning while on Spring Break during "Mythbusters" at the Ypsilanti District Library Whittaker Road branch on Wednesday. 4 to 6 p.m. The kids will experiment and have some fun with fun with some cool science facts. Have them dress for a potential mess. Afterward, they'll enjoy a snack and some real Mythbusters episodes. Grades 5-8. Free. The YDL is at 5577 Whittaker Road, Ypsilanti. 734-482-4110. Enjoy "Jazz at Lincoln Center Orchestra with Wynton Marsalis" at Hill Auditorium on Wednesday night. 7:30 p.m. 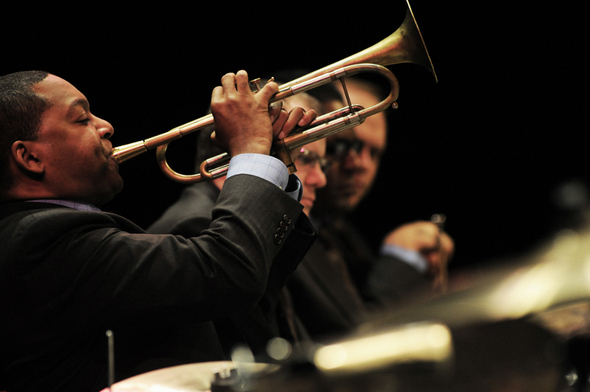 The program will feature some of Marsalis' favorite music, from New Orleans roots to bebop to modern jazz. The ensemble will also showcase a retrospective of Marsalis' music written for big band. Tickets start at $10. For tickets, call 734-764-2538, online at www.ums.org or in person at the League Ticket Office (911 North University Ave., Ann Arbor). Hill is at 825 N. University Ave., Ann Arbor. 734-763-3333. See "Playing for Change" at the Ark on Wednesday. Playing For Change brings its "Back to Our Roots" tour to Ann Arbor. Grammy-winning producer/engineer/filmmaker Mark Johnson founded Playing For Change on the simple idea that the world can be connected through music.The lineup will feature renowned and wildly diverse musicians from around the world. $35. The Ark is at 316 S. Main St., Ann Arbor. 734-761-1800.